Scanning monitor suitable for multiple inputs. THE TP488 range of eight channel scanning monitors from Amalgamated Instrument Co (AIC) offers flexibility, configurability and ease of use for applications that require monitoring and recording of multiple inputs. 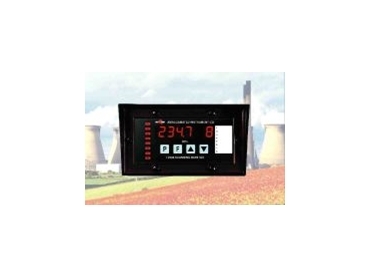 The monitors are available in models accepting eight analogue inputs (4-20mA or a range of dc Voltages), eight RTD temperature sensors (both Pt100 and Pt1000) or eight channels of thermocouple sensors (the type can be set individually). The TP488-TC thermocouple model can also accept direct 0-75mA dc input, offering additional flexibility. Each channel is individually configurable. The wall mounted instruments have eight relays as standard. These can be assigned one relay per channel, multiple relays per channel (each relay with its own LOW and HIGH setpoints) or multiple channels per relay (each channel can have LOW & HIGH setpoints assigned). This flexibility in relay assignment enhances the utility of the TP488 range. A data logging feature with 32K or 128K capacity is available for the TP488 models. Data is logged internally and can be downloaded as required. The feature can also be used in data streaming mode if required. If logs are taken every hour, the 128K logger can store 266 days, 16 hours of data. Capacity is lower if samples are taken at shorter intervals. The data logging feature is shipped with Windows compatible software, which allows the downloading, storage and display of logged data. The software is designed also flexible and the display type, colours and scales, amongst other parameters, can be defined by the user. The software also allows communication with the TP488 to set relay configuration. With appropriate signal conditioning, the TP488 units could be used to store a complete picture of a wide range of parameters such as pH, pressure, temperature and conductivity. The TP488 range is suitable for application in wineries, mines, boilers, air-conditioning plants, weather stations.